A wilderness adventure for 4th-level characters. A vast merchant consortium has a simple job for you—one that pays extremely well. All it asks is that you stand guard over one of its outposts for a few weeks until reinforcements arrive. The problem, of course, is that the outpost is in the middle of a vast and dangerous jungle and the natives seem intent upon putting an arrow in you at every turn. If the journey there doesn’t kill you, though, you might just learn what is worth risking your lives over. This adventure includes all in information you need to send your heroes on a fantastic journey through the heart of the deep and mysterious jungle, including encounters with terrible monsters and hostile natives. 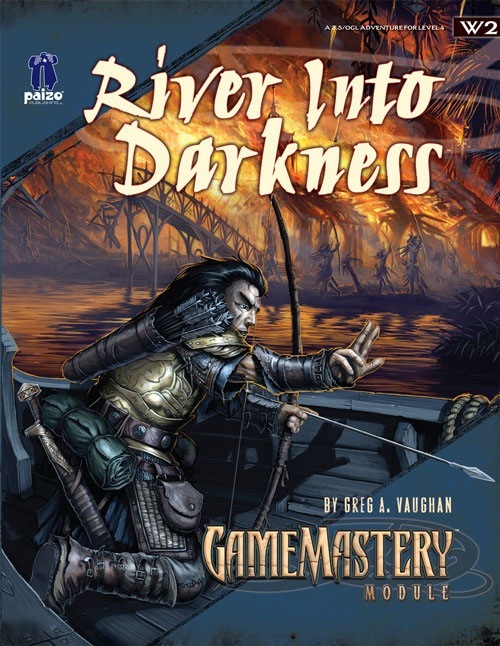 This adventure is set in the Mwangi Expanse, the largest jungle in the Pathfinder Chronicles Campaign Setting, but it can be easily adapted for use in any setting. For more information on this environ, check out the Pathfinder Chronicles Gazetteer. 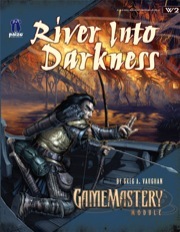 GameMastery Modules are 32-page, high-quality, full-color, OGL-compatible adventures for use with the world's most popular fantasy RPG. All GameMastery Modules include four pre-made characters so players can jump right into the action, and full-color maps to enhance play. Note: This product is part of the Pathfinder Modules Subscription. Greg H. Vaughan, I presume? Let me paraphrase this by saying I am strongly biased towards this adventure. Firstly, Greg's adventures have been responsible for more player deaths than any other adventures I have run (Including Tomb of Horros, and Tied with Castle Ravenloft). Second, I have always loved the jungle adventures of Indiana Jones, Dr. Livingstone, and others. Thus this adventure is right up my alley, but was not perfect. All Aboard! : The adventure opens really well, with a rather dangerous and exciting encounter that brings the PCs to the attention of the questgiver. However, if your party is not the typical band of murderhobos (as mine was) then you will be hard presses to find motivations beyond greed. Old Man River: The river journey was the meat and cheeze of this adventure. Our party took to it with gusto at first, but the module made a really good job at bringing to life all the hazards of river travel in a jungle to life. This wore our party out very quickly as repeated failures and delays, plus encounters where desperately fleeing was the only victory we could secure, sunk morale amoung the crew like a lead weight in water. It was fun in a mastochistic sort of way. Darkest Mwangi: The ending of this dungeon was BLOODY MURDER on anyone who had a consceince. I admit that our party didn't really win this adventure so much as we escaped with our lives and a measely 50gp profit each. Yet I think that it was the type of ending that this adventure was ment to have, and left the players thinking more about the vast gulfs between cultures, environments, and morals just within the party, let alone between us and are multiple opponents. We weren't even sure if what we had done was right, which left us reflecting on this adventure for a long time afterwards. When an adventure can do that, then it's a damn good adventure. Awesome job! This adventure is dripping with flavor. From the start "On The Blood" all the way through to the heart of the jungle, it feels like a storied journey. Not only must the party contend with fantastic enemies, but piranah, mosquitos, and illness are omnipresent too. The Good: As mentioned above, it's got great flavor. This is coupled with a neat fantasy approach to river travel (and all the complications that go with it), a neat and subtle underlying story, and a strong compliment of NPCs and encounters. My party was never bored playing it, and always eager to see what camce next. The writing is solid and the layout is generally good, though at times it became difficult to juggle the many small maps. The end is a great sandbox where each party can react differently to a confusing situation. I am sure players will surprise GMs with their solutions. The Bad: While the end is diverse, most of the adventure is dedicated to a boat ride. This is the classic rail-road scenario: The encounters happen generally at preset times, and the PCs are under the command of an NPC captain. Now, this isn't too heavy handed and those encounters are interesting (it is what they signed up for!). But it did feel like the players were simply waiting for the next encounter as the boat moved along. Further, the ending is a touch anti-climactic, and likely ends with the PCs moving down the same river just came up. Overall, I recommend the adventure and think it will please most parties. Great but with some small issues. I while not my favourite adventure released by Paizo this is a cracking wilderness adventure. There are a fair few things that could have been tweaked just a little bit to make it better. Personally I didn’t mind the whole make your own hook approach. It may not suit some DM’s but with Bloodcove being such a great city I will have no trouble getting the PC’s there. The encounters while somewhat disparate worked for me. I can’t go into real details without spoiling anything but I felt it all hung together well, with a couple of really cool flavourful encounters. I also like the open ended nature of the final event although I think they really should have explained the options a bit more clearly. So what are it’s issues? For one the monsters, the two new monster are both quite unimpressive. Worse neither of them is used in a particularly interesting way one is in fact just a random encounter. Also I felt Bloodcove needed more detail as it is amazing sounding city. I know it is due to the limited page count but still I think it could have done with further detailing. All in all a real good module just unfortunately lacking in a couple of places which is the only thing that robbed it of a real classic. Still a great module that I recommend. Let me begin by stating that the basic premises rock! The adventure takes the party by a pseudo-steamboat up a tropical river, and forces them to content with all manner of unpleasantness on the way. The "feeling" is there, and a few surprises as well. Why only three stars, then? Because it is not a very good adventure, truth be told. The encounters are disjoined, and do not neatly flow into a single narrative. The motivation for taking the "boat trip" is not as good as i would have hoped ("do it for greed, or have the DM come up with a better reason"). Likewise, the conclusion feels disjoined, and while i like the fact that there is no overdone happy ending, the options do not quite cut it. This module is by no means all bad - but it is not on par with some of Paizos other offerings. Is there a possibility to find (or buy) the maps without the numbers and notes (and if possible at a slightly better resolution). I play using a screen to display the tactical situation. With the maps without numbers and notes, I could directly use the maps to play upon them. I would certainly be willing to pay for them. Get a copy of the PDF. Using the Select Tool in Adobe Reader, you can Copy/Paste the maps into programs like MSPaint. Because of the layering of the PDFs, the numbers and tags aren't transported along with the image. The only issue here is that some of the maps don't copy as one complete image. Instead, they come in pieces which you'll have to put back together. DO NOT USE THE SNAPSHOT TOOL! Doing so will include the numbers and tags in the image. I have the PDF. And I did just snapshooted it. I had no idea that selecting would leave all the numbers and tags behind. Having the map in pieces is not aproblem, I can always put them back together. I don't understand all the tech-talk very well but from what I can make out, the numbers and tags are not actually part of the image. They are text on a transparent layer over-layed onto the image. So... when you use the Select Tool to "Copy Image", the text overlays are ignored and only the image is copied. At least that's my understanding of it. If you are copying pics of NPCs, you definitely want to use the SnapShot Tool. The pics have solid black backgrounds that are set to appear transparent. However, if you use the Select Tool and copy/paste the pics into programs like MSPaint or PaintShop, the black background becomes visible and can be really difficult to get rid of. Hey! Shut up, Greer! I'm trying to work a deal on a Disneyland ride out of this. Still haven't gotten mine, and according to my order history it shipped on 9 April. Isn't there some kind of hex Paizo can put on those post office bastards to get me my product faster? were not elves. It's an unavoidable meta-hint that the natives are the good guys in this module. I think I'll be changing them to gnolls or goblins just to make the mystery more difficult. That's part of the deal. They aren't actually good guys. And they aren't actually bad guys. Of course, you can do whatever you like, but if you make them goblins or gnolls it could ruin some of the motivation to help them. I.e., oh look, the somewhat evil consortium is using goblin forced labor. Oh well, better that then letting the goblins run loose and threaten the surroundign villages. There's a great deal of moral ambiguity throughout that leaves a lot of options on how it plays out and whose side the party falls upon (if any). However, I wouldn't play the elves as good. They're brutal savages by the definitions of the "civilized" PC cultures, though they certainly have their redeeming and admirable qualities (heck, they are good guys in an upcoming adventure not to be named right now) but they don't play by the "civilized rules" and would rather slaughter a whole bunch of innocents (Whitebridge, for instance, that doesn't really have much to do with the Nightfall operation and certainly not with the lsave activities) rather than let this injustice against their people continue. Plus there's the fact that its a couple of elves that are behind part of the deal. Okay, so that's probably way more explanation than you were looking for, and for your group it may be too simple to just say they're good guys. But my intent was to throw some curves into it (hey, the good guys are sure shooting first a lot and not bothering to ask questions at all) and just have the elves not be good guys or bad guys, but just guys. Kinda' like humans. I'm gonna run a Paizo module at ReaperCon this year, & I'm leaning toward this one. I need to change a couple things (mainly to have the game fit inside the Reaper World), but I'm in the process of "building" a River Queen out of styrene. I'm not gonna all out full blast on it. I figured if it's gonna be a major feature in the game, might as well spend some time on it. Also in the process of getting minis for the crew & such, just can't find a good mini to represent Hurg, with his unique look, I'd like to find something that resembles him. Great module, btw simple concept, but it has a good feel to it. Thanks, Haldir. Glad you like it. I thought it seemed like a pretty simple concept, too, when I pitched it. Just a nice little romp up a hostile river. Be sure and post some pictures of the River Queen if you can when you get it done. That's not quite my point, so I've expressed myself badly. What I mean is that using elves is going to immediately clue my player into the fact that the Consortium's up to something fishy to provoke the elves strictly because they're elves. So, because they're elves, my player's very likely to start actively investigating almost immediately... rather than slowly realize that this scenario is more morally complex than a "fight off the savages" colonial narrative. For example, if this module had used orcs, then there might be the moment of reveal that produces: "Huh. Orcs are people too." The players would have to confront their own xenophobia. In short, because they're elves, there's a decreased likelihood of the party having an "Oh, #$!#$!" moment of moral revelation. They won't be as likely to be implicated in the moral complexity, because they'll be less likely to behave dispicably towards elves than towards orcs or goblins. It's a trade-off. As written, the party suspects shenanigans right off the bat and gets the pleasure of solving a mystery: What did the Consortium do to cause this war? And they're less likely to face the dilemma of their own actions towards a racial Other. With another race, maybe the party gets the pleasure of solving a mystery and making difficult moral choices under fire. If the natives were tribal humans, would it be different? If you play it as a fight between the "civilized" Consortium and the "barbaric" natives, the basic premise is not one of race, but of technological development and culture. If you depict the elves as extremely chaotic, or even verging on evil in their actions and behavior, this might make the morality easier to swallow. Then the motivations behind the elves' actions would provide the moment of realization I think you're looking for. What alignment is the party, if you don't mind me asking? This is my first ever Game Mastery module (D0 doesn't count), and I like it a lot. Who'd have thought African Queen meets Heart of Darkness would work so well in D&D. I'm going to see if I can add a bit more of Apocalypse Now to the mix. "I love the smell of alchemist's fire in the morning. Smells like ... victory!" The one PC is a CG Bard/Rogue, with two CG NPC companions and a LG heal-bot NPC. They're privateers who hunt pirates, amongst other missions. And their crew is partially composed of Paizo goblins. The player finds them cute as the dickens and is trying to wean them away from being evil little bastards to being neutral little bastards. At a climactic trial she claimed that "Goblins are people too." She said that they weren't responsible for their actions because they had been bullied by the human pirate who commanded them. She then nailed the Diplomacy check, which bards are wont to do. So the court gave her custody of them. She's been using strict discipline on ship while giving them utter freedom off the ship. (She studiously avoids checking up on the rumors of chaos on their shore leaves.) She's been using candy and crunchy foods like a behavioral scientist. She's actually succeeded in civilizing ONE of them, who's become the bo'sun and he bullies the others mercilessly. I'd probably change them to humans then, just t maintain the moral ambuguity. My players would be too prone to just saying screw the orcs (or whatever other traditional bad guy race) even after finding out about the mistreatment. However, every DM must account for the intriacies of his/her own players, so that may not work well with yours. So definitely change it to whatever works best for your guys. I guess with my players, after I've kicked the crap out of them a couple of times with wild elves, they don't have any problem seeing elves as bad guys, so the race doesn't create the same issue and suspicion as you have mentioned. My goal was to play more of the "civilization" versus "savagery" angle rather than the racial angle to create an uncomfortable dilemma for the PCs since many parties would probably relate better to the Consortium even though they are not portrayed as particularly good even from the beginning Gather Information checks than to the wild elves who should seem just that--wild. That's why I included bits about the elves that don't paint them in a particularly good light either. However, you should certainly go with what plays best in your group. Thanks for the comments. Oops, I kinda' rehashed much of what yoda said. Sorry I missed your spoiler there, yoda8myhead. Damn it!!! According to my Order History, my copy shipped on 9 April and I still haven't received it! That's 12 business days, not including today. F~##ing post office! AAAAARRRRRGGGGHHHHH! I like the race in question, but like Greg I have used them enough as bad guys in the past that is not a issue. Straight out of the pages of Exemplars of Evil. I think I missed something :) Of course i have not read the Exemplars of Evil book so maybe thats what has me wondering what you two are talking about. But yes the post office is evil, it works for the government after all. The U.S. Post Office is part of the government, which is why crimes against them are Federal offenses. They are also the only Federal agency that is 100% funded internally (through postage fees); they don't receive a single cent of tax revenue (Ben Franklin set them up that way, IIRC). I posed this question in a different thread but I figured I would try looking for an answer here as well. The payrate in this adventure is 20gp each day, right? When exactly do these "paid days" start? At the beginning of the journey upriver or upon reaching Nightfall Station? Since the PCs are trying to get hired on as mercenaries, I would think the pay doesn't start until they reach Nightfall Station and they are actually hired as guards. Protecting the River Queen is the "fee" the PC pay for the captain giving them a ride upriver to the station and their prospective jobs. Yet... at the beginning of the journey, the riverboat captain pays them a certain amount of their mercenary wage in advance. Pay starts the day they hit the river for the journey, part of which is fronted by Esteban. Just ordered this along with some other stuff. Looking forward to this one. Ive been a fan of the Jungle stuff since the RPGA's Living Jungle thing many years ago. Greg's writing it is a bonus. Ive liked his stuff since Tammeraut's Fate in Dungeon #106 iirc. The Istivin arc and Hateful Legacy in #131 were great too. I wonder if the second part of the adventure works as well as the first part does, as a gaming scenario. I feel like the pace slows down significantly with the PCs just operating as guards for the facility, and that it may get more boring for the players with the sudden shift to no active direction, especially after the action packed river journey. Anyhow, hopefully I'm wrong, but I was just curious as to whether or not anyone else had similar concerns (or better yet if anyone has ran it already and can speak from experience)? Am I the only one who remembers the "aspis" insect-folk from 1st Edition? I'll be running this adventure in the next couple months, but I can't resist: the top (and middle) tier of Aspis Consortium members are going to be ant- (as opposed to mantis-) shaped Thri-kreen. Ha! How much time have I squandered trying to come up with a 3.5e conversion for them that I was finally happy with? And somehow it never occurred to me to just use thri-kreen. Thanks! But, man, I'll never forget when we first ran into them in "Slave Pits" 25 years ago... I sure wish Paizo would do a slave lords AP. It seems that nothing riles up the typical murderous, tomb-robbing, law-flouting party of PC's as fast as slavers. You want the party to instantly dislike otherwise decent NPC's? Give 'em a slave. Now, enchanting a creature to adore and follow you, that's okay. Psionically dominating a herd of thralls, that's fine. Contracting hirelings with the expectation that the Black Jaguars will eat them and you won't have to pay for their services, that's par for the course. But don't let the party catch you with slaves. (Nods.) Been programmed into us since we were nine years old. Most especially if the slaver cleric belongs to an obscure "earth dragon" cult. Oh, and if they have monks. Evil monks trigger a genocide large enough to make slaving seem a minor peccadilo in comparison: "The Tilvanot Peninsula... today, a tropical paradise inhabited by evil monks... tomorrow: a smoking ruin." Not at all. The things I write are never as clear as they seem in my own head. If it was confusing for you, I'm sure it was confusing for others, so I'm glad you asked. I'm glad you enjoyed them. I hope to keep you pleased even if unable to continue to do so through my favorite campaign setting of all time (i.e. Greyhawk). I have to say, though, Golarion is off to a great start in my opinion. violence of an egregious nature. No way, man. My first question when James and Jeremy asked me to include the Aspis Consortium was "Greek shield variety or bug-slaver variety?" A1 and A2 in particular are two of the greatest adventures ever written after B10 Night's Dark Terror (I'm a sucker for that adventure). Love this one, its up there with Entombed with the Pharoahs as one of my favorites. I think the Jungle setting in general never got much exposure previously before the Savage Tide. "I like what they did with the place" - The Mwangi Expanse is great backdrop and I like the fact that its a low level module. I also like the flavor of the encounters as they fit well. I would love to see a higher level sequel one day, level 10 or 12 maybe. Late Edit*** - Greg, this one is excellent. More Jungle mayhem please! ...prepare the players not to think of the wild elves as good guys. I think I have my plan, a reason the elves would attack a beloved NPC. And, by the way, I concur: the attention to detail, emphasis on mood, and exciting combats make this one of Paizo's best modules to date. I just wish I owned copies of the Tome of Horror books. Agreed,I see more and more ToH references from Paizo. Im going to pick up the revised PDF this week. Ive been putting it off for awhile now. BTW, is the Advanced Bestiary a pdf only? Is it available in print? It may take some looking, but Advanced Bestiary might be able to be found in print. No need to look at all. We have the Advanced Bestiary for sale here on paizo.com. Thanks all. I'm glad you like (and I like how you think, Chris--Heros of Horror, heh, heh). That's high praise indeed, considering how awesome Entombed with the Pharoahs is. Tome of Horrors is one of my favorite OGL monster sources, and though I only recently obtained the Advanced Bestiary, it also gets a lot of play in Paizo outings. I highly recommend them both (and TOH 2 and 3 for that matter). As for TOH, I am waiting for the Paizo update that's been bandied about in other threads. I'm all for the Paizo/Necromancer tag-team, and hope to see the results of it soon! I just read the thread about the possible ToH revised/pathfinder edition thing, any news? ...Maybe you can co-write it with Steve Greer so to make up for his bitterness over this module selling better than his. Bitter?! Me?! Naw! I'm happy as a pig in mud for Greg. The man deserves all the success he gets. He's a great guy. Oh, and just for the record, I'd love to collaborate on just about anything with Greg Vaughan. We're both old school 'Hawkers all the way. But I don't think Greg needs any help from me writing kickass adventures. Though now that I look at it, Demon Within is at the top of the list, so looks like people just needed to get from level 4 to 11. Definitely a very cool module. I just got it and skimmed through it and was immediately inspired and excited. Great maps, too (eg. Whitebridge). But there's too little on Bloodcove. The map and general layout of the city is freaking awesome, but nothing was given about it. What is the population? Basic leadership and demographics? Now, I'm guessing that just like the Aspis Consortium, those "Houses" are merchant consortiums as well. Are they? What about those other locations...?